First Great Western (FGW) is to be offered a new franchise which could last up to four-and-a-half years, the Department for Transport (DfT) says. The train firm currently has a short-term extension to its franchise which runs out in September 2015. The new franchise would cover the entire period of upgrades taking place on the Great Western network. 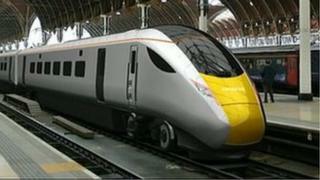 It is also likely to include a replacement fleet of suburban trains for the Thames Valley. The deal means that the current FGW management team will remain in place throughout Network Rail's electrification programme, the new multi-billion pound fleet of intercity trains - to be built by Japanese firm Hitachi - and the launch of Crossrail services to Reading. He added: "This offers good value and better services for First Great Western passengers and, in particular, will provide stability and allow the planned major projects and new trains to be delivered." On Wednesday FirstGroup lost the battle to run Scotland's trains as the ScotRail franchise was won by Dutch rail operator Abellio. Tony Miles, of Modern Railways magazine, said having the same, "most experienced" team in charge of the upgrades would be most beneficial for passengers. "It's the most sensible decision to take while Great Western is undergoing this period of massive change," he said.